“This thing is dangerous… It’s bigger than both of us,” yawned pugnacious psychedelic troubadour John Martyn in his song Big Muff. He had a point. The original Big Muff enclosure contained more fresh air than just about any other stompbox to date, but the advent of the EHX’s nano design (with its joyful standard power jack) makes the Big Muff a serious contender for even the most space-conscious pedalboard owner. This Op-Amp model is the third nano Muff Pi in the EHX range. At first glance the existing Big Muff Pi Nano and Green Russian Pi models might have the grungier end of the sonic spectrum covered. This new pedal, however, was built in tandem with Smashing Pumpkin Billy Corgan (it even says “Your Slice of Pumpkin Pi” on the box) and features switchable Op-Amp circuitry to provide authentic vintage Muff tones. Given that Corgan played a huge role in the resurgence in popularity of the Big Muff in the 1990s, this is significant news. With a similar design to EHX’s excellent Canyons delay, the Oceans 11 reverb hints at a huge amount of functionality with a total of 11 separate reverb ‘voices’. 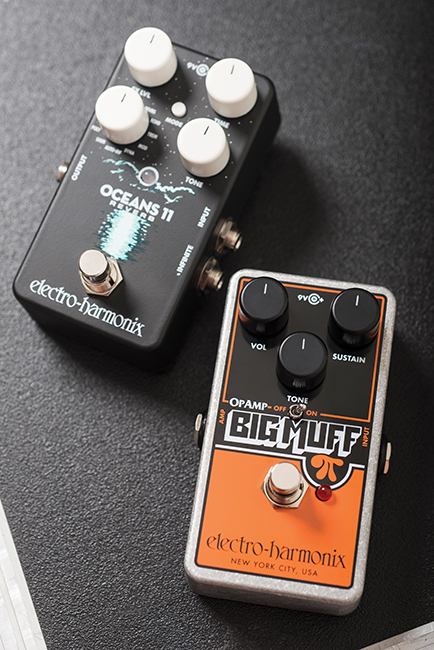 This impressive selection is further increased with a responsive footswitch (allowing double tap and hold for certain features) a Mode switch and even a jack for an external footswitch, making the Oceans 11 one of the most feature-packed pedals of any kind that we have seen at this price point. Given the Pumpkin associations, there’s only one sensible course of action when plugging in the Op-Amp Muff – give it a bit of Billy. Conscious of the fact that he achieved his sound from judicious balancing of master volume and preamp gain stages we do likewise with a tube-driven Marshall amp. With imagined snare drum rolls in our ears, we pound out the iconic clean riff from the Cherub Rock before stamping expectantly on the Op-Amp Muff and basking in the roar. It’s that Siamese Dream sound, or near as damn it. And yet there’s more – with the Op-Amp engaged it’s a very good Muff sound for any genre. It’s grippy and nuanced enough for Gilmour and can even do early Sabbath tones. 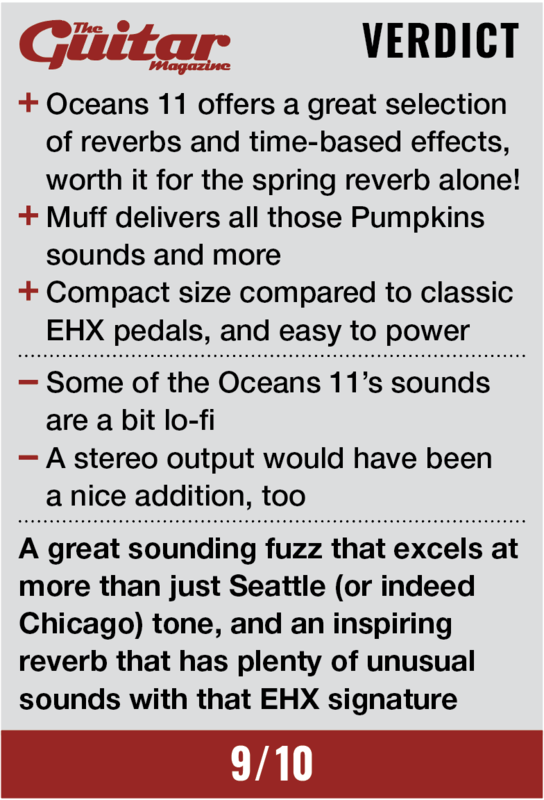 Given the sheer amount of sounds on offer with the Oceans 11, we could happily triple the length of this review, but here are the highlights – the first being an exceptional spring reverb. A marked improvement on that found on the Holy Grail, this setting even gives you a “kicked reverb tank” crash for all your surf needs with a double tap of the footswitch. The Revrs setting (a reverse reverb effect) is spooky and inviting, especially for lead tones. As the names suggest Echo gives you a pleasing digital delay feeding into a plate reverb, Trem is a tremolo effect which can be further tweaked with the mode switch allowing everything from subtle pulsing to almost ring-modulated madness and Mod provides all you could wish for from a gentle wash of chorus and vibrato to the outright lunacy of the classic EHX Flerb (flanged reverb, for the uninitiated). Holding the footswitch down also triggers the infinite setting (like a self-oscillating delay) on most of the reverb settings. The Dyna setting works like a slow volume for dramatic swells and cello noises (tracking remarkably well) and at six o’clock on the knob we are greeted by Auto-Inf, which listens to your playing and crossfades to a new reverb wash upon every attack. This is particularly atmospheric when coupled with distortion and/or fuzz. Finally we have Shim and Poly, two varieties of pitch shift, the former adding an upper octave wash and the latter giving you two configurable pitch shifts. We find these settings particularly worthy of exploration. It’s worth noting that all the sounds respond well to tweaking, too. We spend several inspiration-filled hours finding new and musical textures with the Oceans 11 and although some of the sounds are decidedly on the lo-fi end of things (it won’t kick your Strymons or Eventide H9s off the upper left corner of your board based on sound quality alone) it still represents good value. With this brace of new EHX pedals, we see a company consistently unwilling to coast on its reputation. Like other stompboxes in this now classic range, both units are musical, inspiring and relevant across various genres for not a lot of cash.